I made it through the whole Winter without getting sick only to have a cold strike me this Spring! Grrr! I wasn’t about to give in and settle for a 2 week cold. I knew I needed to whip up a batch of homemade elderberry syrup so I’d have a fighting chance at kicking this thing in less time! 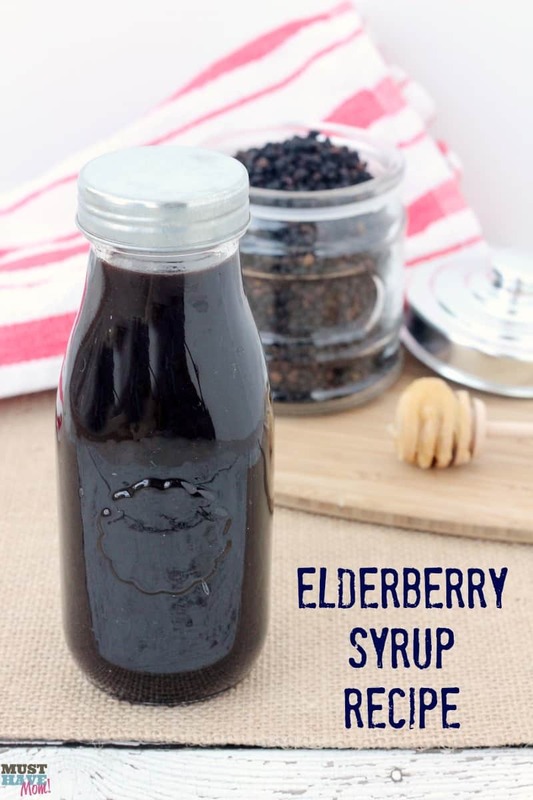 Elderberry syrup is great for cold and flu prevention as well as reducing the duration of a cold or flu. 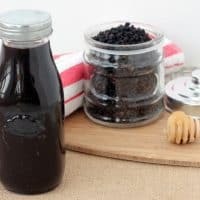 This elderberry syrup recipe is easy to make and only takes about an hour from start to finish. Most of that time is simmering it on the stove so you aren’t actively making it for that long. 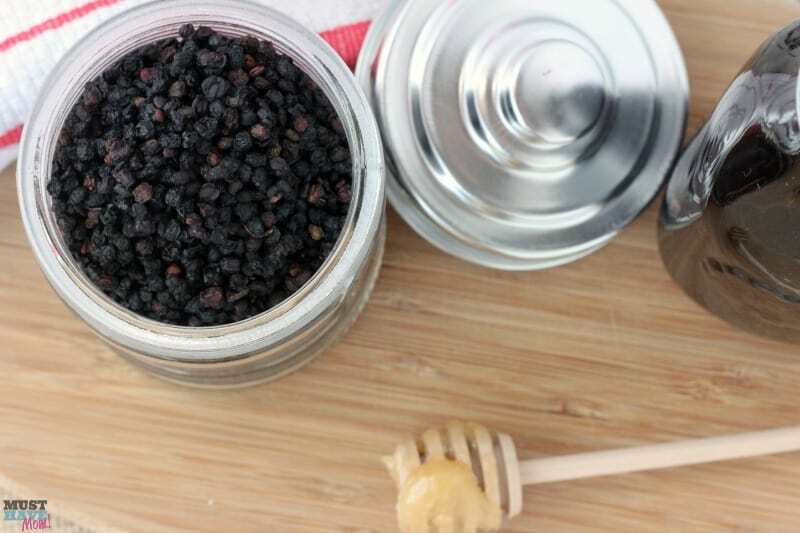 This elderberry syrup recipe uses the dried berries of the Sambucis Nigra plant. These berries are naturally high in immune-boosting compounds that are specifically shown to help beat the cold and flu more quickly. Elderberries contain high levels of A, B, and C vitamins and they help stimulate the immune system to prevent or treat cold and flu. Read more about how elderberry helps prevent cold and flu or shorten the duration of illness in my elderberry gummies recipe post. 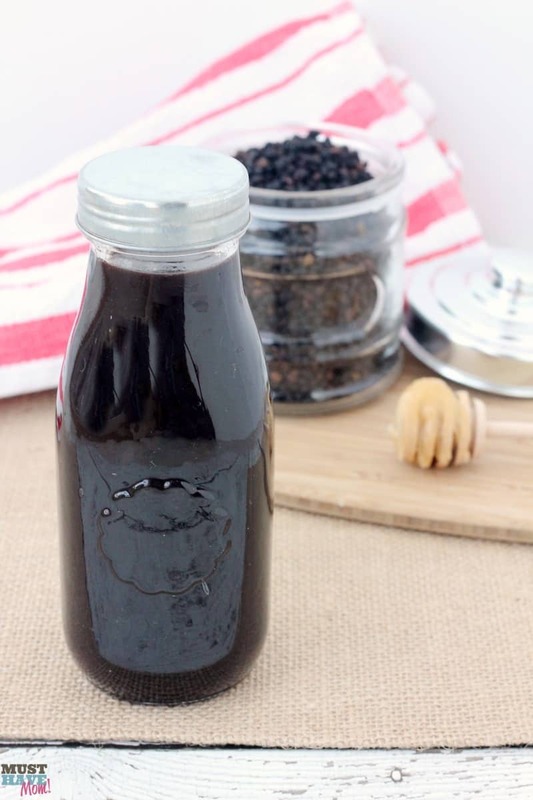 You can buy natural elderberry syrup but it will cost you about $16 for just 4-8 ounces. This recipe will make about 16 ounces for under ten dollars and it tastes better than the varieties I have tried from the store. 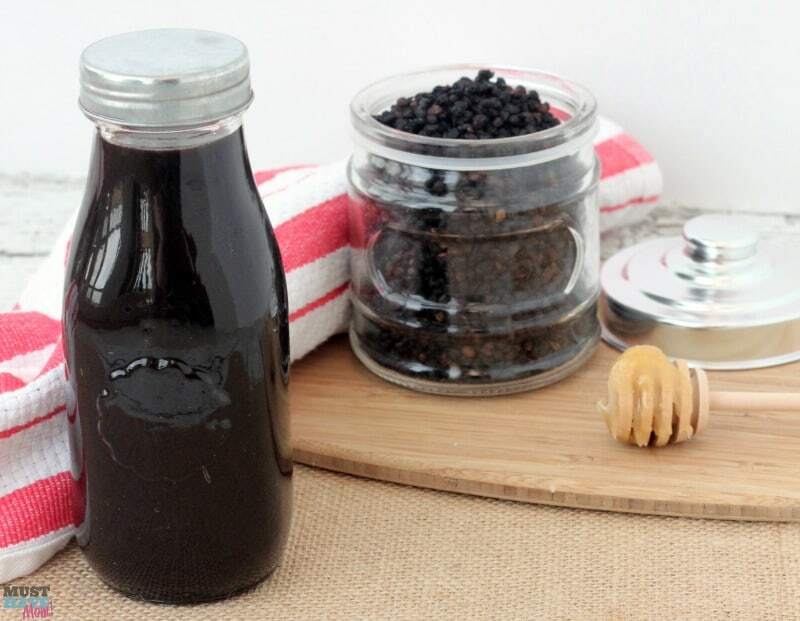 You will need black elderberries to make this elderberry syrup recipe. I bought mine in bulk from Amazon and saved a bundle. 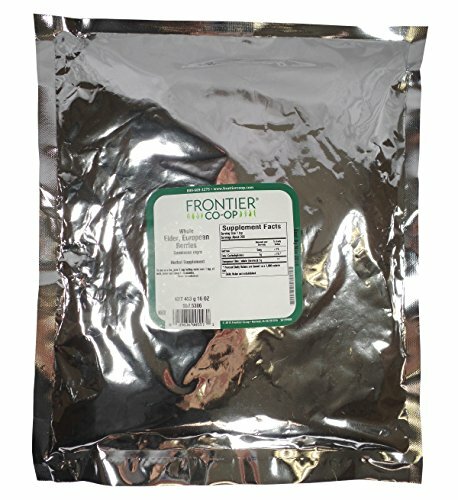 They are freeze dried and keep for a long time so by buying them in a one pound bag I am able to make a ton of elderberry syrup from just one bag. Plus I love that the black elderberries sold on amazon are also organic! 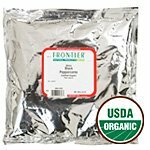 At around $17 for a pound of dried berries, you’ll be far ahead because you can make so many batches from this one bag. Just store it in a cool, dry place inside an airtight container. You’ll also need raw honey for this recipe. Raw honey differs from processed honey in that it retains beneficial enzymes that heat destroys. Be careful to follow the recipe closely so you don’t kill those benefits of the raw honey by adding it to your syrup too soon! You need to wait until it cools! Raw honey has also been shown to help with allergies so it is most beneficial to buy your raw honey locally. 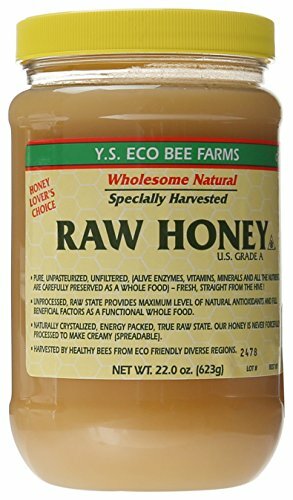 If you are unable to find raw honey that is local to you then you can buy raw honey here. The reason it is so beneficial to buy local raw honey is that the bees have used pollen from your own local plants so if you suffer from allergies the honey made with that pollen can benefit you in reducing your allergic response to those allergens. To make the elderberry syrup you will need to simmer the berries with water, ginger, cinnamon, and cloves for about 45 minutes. This will reconstitute the berries and reduce them into a syrup. It’s important not to add the raw honey until after the mixture has finished simmering and cooled completely. Take once daily for an immune boost. Kids take ½ tsp to 1 tsp daily. Adults take ½ Tbsp to 1 Tbsp daily. If you are experiencing the flu or a cold, take the normal dose every 2-3 hours instead of once a day until symptoms disappear. 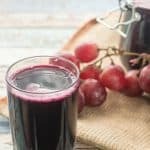 Homemade elderberry syrup that can be taken as cold and flu prevention or reduce the duration of a cold or flu virus. 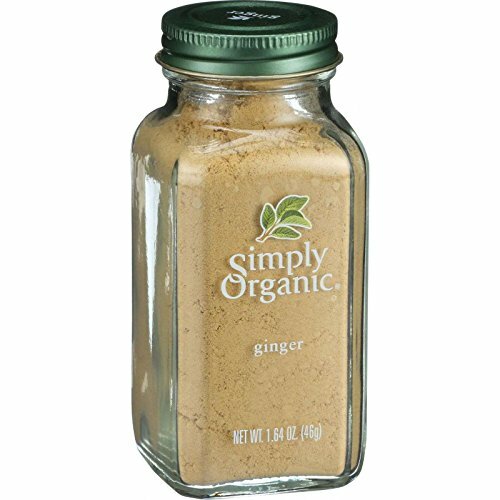 2 Tablespoons fresh or dried ginger root use fresh if possible! Bring to a boil over medium high heat. Once it has reached a boil, cover and reduce to a simmer for about 45-60 minutes or until the liquid has reduced down to about half it's starting volume. Remove from heat and let cool slightly. Using the back of a serving spoon mash the berries as much as possible. Pour mixture through a metal sieve into a glass bowl and mash the berries again while in the sieve to extract as much juice as possible from them. Toss the elderberries. Allow the liquid to cool to room temperature. Once cooled add 1 cup of raw honey and stir well until combined. 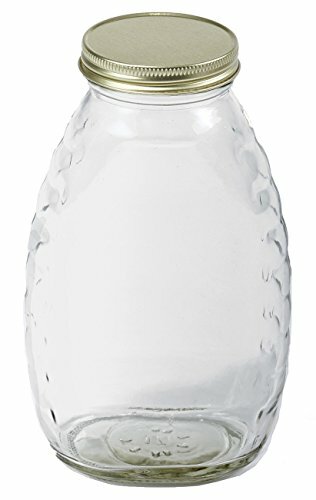 Pour the syrup into a 16 ounce glass bottle or jar. Be sure to pin it or share to Facebook if you enjoyed this recipe! Homemade Electrolyte Drink Recipe + Easy Tricks When Caring For Sick Kids! 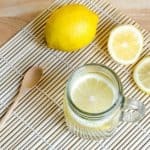 Natural Ways to Prevent Cold & Flu Even If You’ve Been Exposed! 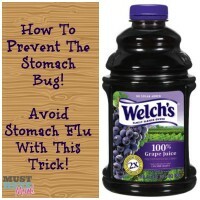 How to Prevent Stomach Flu Grape Juice Is The Trick! « Free School Lunch Hero Day Printable Thank You Cards For Cafeteria Staff! I love this!! We always buy our son elderberry syrup (b/c he gets sick so much) but it would definitely be nice to know how to make as well! It is so nice when you can make your own instead of buying it. Thanks for this do you think it will work just as well with fresh elderberries. The elderberry trees round here are about to flower soon, I make champagne with Elderflowers. I will try out your cordial with the berries when they are ripe in Autumn. Absolutely, I think you could easily use fresh elderberries. I bought mine freeze dried so I see no reason why fresh wouldn’t work also. 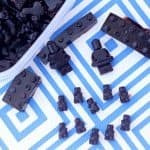 So much better than store bought and your pictures are fantastic! Thank you. And I agree, anything you can make on your own is always better than store bought. We’re fighting off sickness right now. I needed this in my life! Thanks for sharing! It really works well. I hope you are all feeling better soon. My husband was just asking if I knew how to make syrup. I didn’t and then I find this, love it! Thanks for linking up with Delicious Dishes Recipe Link Party! I’m so excited about finding a recipe that uses freeze-dried elderberries. It’s so hard to find them in our local stores so this is exactly what we need. I will pass on this recipe. Thanks for sharing!! You are welcome. I needed something that use freeze-dried as you can find them all the time. I need to remember to make this for cold season this fall! This is a great recipe! Thanks for linkin’ up with What’s Cookin’ Wednesday! This syrup looks so yummy and I would love to put is on pancakes and waffles. Thanks for sharing a yummy recipe! I have never heard of Elderberry syrup before. this sounds really beneficial for the cold and flu season . I will have to remember this the next time I get sick. Thank you for sharing this. How long does a batch last? Also should this be kept in the fridge or pantry? Thanks!